Typical All Bar One - OK food and not so cheap beer... but that said, you know what you get and I go there a fair bit. OK for meeting up before heading into town. 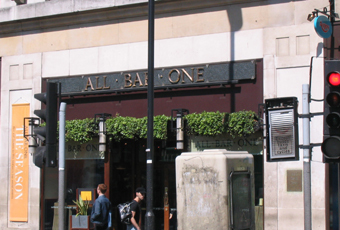 All Bar One's are pretty generic - had a couple of glasses of wine here at the weekend & thought it was a good place to be. Staff were quick & friendly, the bowl of fries we had to nibble through were great & apart from them not clearing up properly after a girl who was slaughtered & had been 'unwell' all round the booth she was sitting at... it was good & I'd go back! I have to agree with Smudger - how can a bar change so much with a new Manager? Food is great but why do they serve fries with mayonnaise? Are we in Belgium? Wine is usually tip-top and if you get a dodgy bottle, it is quickly changed. Confusing for tourists - is it table service or not?